A view of the Pleasant Valley Preserve through which the newly-identified trail passes. On Saturday, Dec. 1, at 10 a.m., the Lyme Land Conservation Trust will host a ribbon cutting for the opening of the George and Rosemary Moore Trail. This event will be held at the Mount Archer Woods Parking Lot, Mount Archer Road, Lyme. 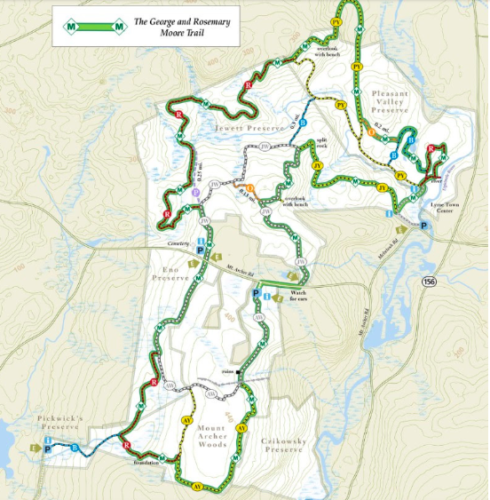 Map showing the George and Rosemary Moore Trail. The new trail, named to honor George and Rosemary Moore’s 14 years of service towards land preservation in Lyme, uses existing trails to provide a seven-mile scenic loop in the River to Ridgetop Preserves through several properties owned and/or managed cooperatively by the Lyme Land Trust. Town of Lyme and the Nature Conservancy. Come for the ceremony only or join a walk afterwards. 1. The entire seven-mile loop. Bring a picnic lunch. This could take four or more hours depending upon the speed of the group. 2. The Northern half– about four miles. This could take about three hours. Bring a lunch if you wish. 3. Mount Archer Woods – to the ruins and back — about 3.5 miles. All tours will start and end at the Mount Archer Parking Lot. Bring a picnic lunch and water. Snacks will be provided. 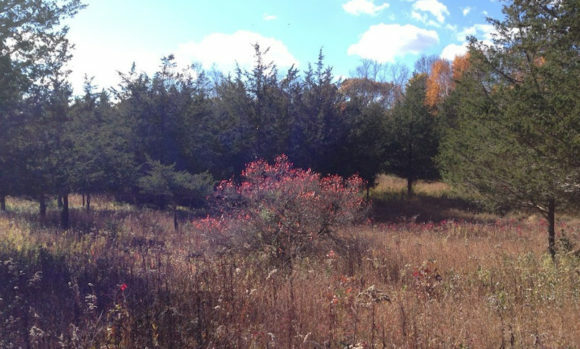 Reservations are requested at openspace@townlyme.org with your choice of which walk you wish to join. George Moore, former president of the board and the first executive director of the Lyme Land Trust, retired in 2017. Through his vision and effective management, Moore helped transform the Land Trust into one of the most active and successful trusts in the State. Inclement weather will cancel this event.